Today, we’re excited to launch our newest product — News Data Feeds. 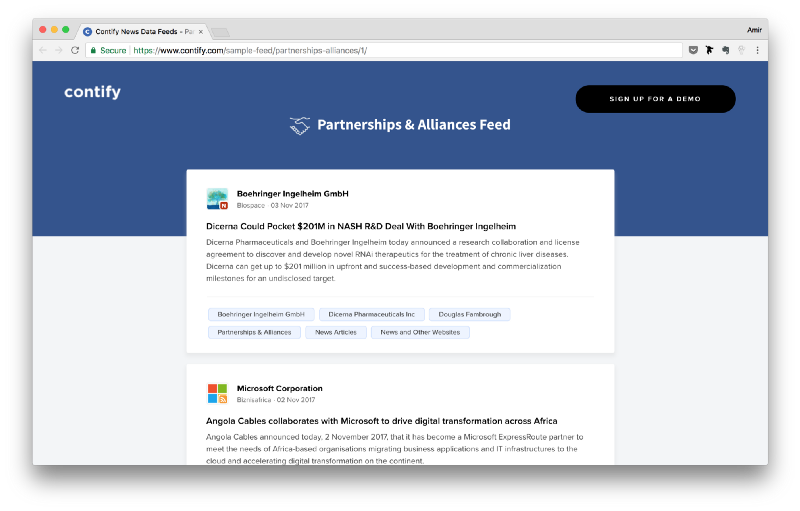 Organizations that need news updates on companies, business topics, and industries at scale, can now get them as a ready-to-consume feed through our APIs or as RSS/XML. Actionable news updates about companies, business topics, and industries have been central to our Market Intelligence solutions. The content we aggregate, clean, and tag has enabled thousands of professionals to track their competitors, engage with their key accounts, keep on top of changes in their industries. With News Data Feeds, you will now have access to the same curated content that powers our award-winning products. There are organizations ranging from market research companies to software vendors and information service providers that need business updates at scale to keep their offerings fresh with live feeds. Some companies attempt to build web monitoring capabilities but soon realize it’s a full-time pursuit that requires significant investment and draws resources away from their core business. To address these challenges, we are making clean business updates accessible to everyone with this new solution. You can look at some sample feeds here. Our News Data Feeds are already being used by leading companies for different use cases: An account management app provides company intelligence using our Business Expansion feeds. A market research firm monitors Fortune 1000 healthcare companies using our Healthcare Industry feed. And a competitor intelligence software aggregates marketing materials of companies using our Marketing Content feed. We’re excited to see how our new solution can help your business. If you’re interested in a live demo, sign up here.